Dreaming of a private island vacation, but can't quite afford one? If you're looking for peace, quiet, and privacy, you've just stumbled upon paradise. Welcome to Turtle Cove, North Eleuthera, Bahamas. 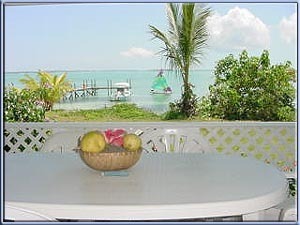 Turtle Cove is the most secluded villa rental on mainland Eleuthera Bahamas. 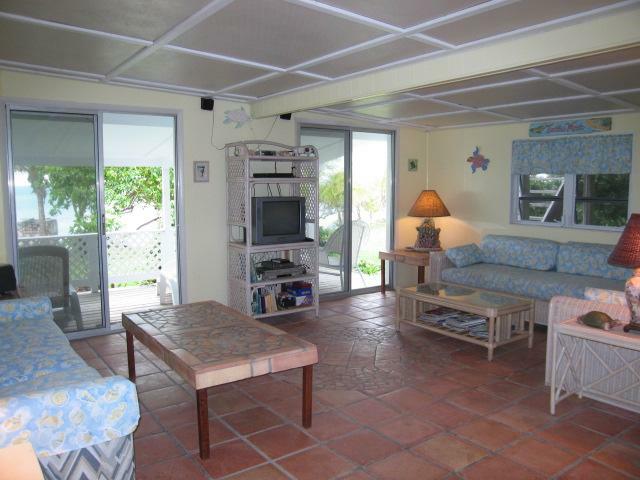 This lovely, spacious, fully-equipped 4BR/2BA vacation home rental is located on a peninsula of four beautiful oceanfront acres of tropical fruit trees (at least 20 different varieties) and flowering trees in every color of the rainbow. The landscaping around the Turtle Cove villa is truly a delight to the eyes, and is a wonderful place for bird watching. 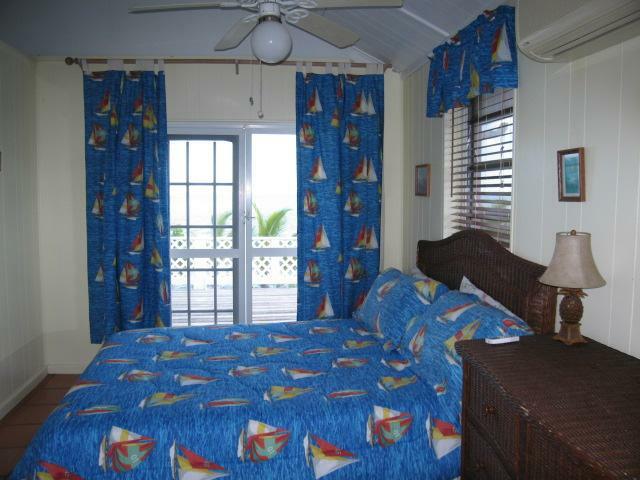 Turtle Cove offers a fabulous view of the sea, the sunrise, the sunset, Harbour Island, and other surrounding cays. This native-style Bahamian villa offers its own private dock and coves of deserted pink sand beach that are private enough for private swimming and sunbathing. 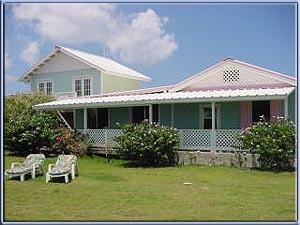 The closest neighboring home or commercial establishment is more than three miles away in any direction; yet, Turtle Cove is within a short ride by boat and/or car to Harbour Island, Spanish Wells or other quaint towns on Eleuthera where you may visit historical landmarks, dine at quaint eateries, browse the native markets or explore interesting caves. The famous, historic Preacher's Cave is only a few minutes away; it is a great place to explore. Preacher's Cave is where the first European settlers took shelter after they shipwrecked on Devil's Backbone Barrier Reef in 1647. 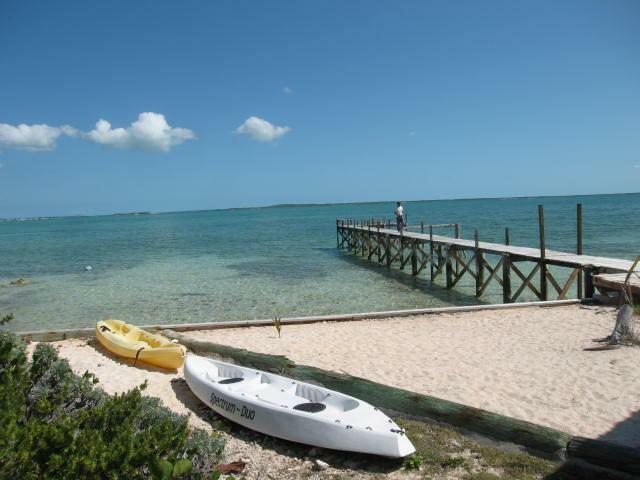 The area is known for its great bone fishing; bonefish have been caught from the home's private dock! The area also offers great snorkeling and fishing, and the famous Devil's Backbone Barrier Reef is less than a 1/4 mile away. Devil's Backbone Barrier Reef is world famous for reef fishing, lobstering, and snorkeling, and plays a very important part in the local history of the surrounding islands. Turtles and pods of dolphins frequent the area around Turtle Cove, and there are many deserted nearby islands and beaches to explore. 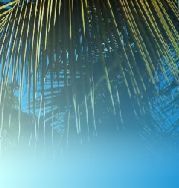 Fishing charters, diving charters, snorkeling guides, tour guides, caving excursions, rental boats, and rental cars are available for your enjoyment.....or you may just want to relax in paradise. Turtle Cove is great for those rental parties that definitely want to stay off the beaten track. If you are looking for a real natural escape with no neighbors right next door, and where the fishing and snorkeling are second to none, then, Turtle Cove is the place for you. Most guests never see another soul at Turtle Cove; a few run into a lost tourist or two or a local farmer turning around at the end of the road. Please note that Turtle Cove is completely "off the grid", and, as such, water and electricity conservation is strongly encouraged. A vehicle rental is required at this location as at all locations on Eleuthera. Rates for two persons: $1895/wk. year round except Jan., Feb., April 1 - 15 & May 25 - September. December 10 - 20 $1995/wk. Christmas/ New Years $2295/wk. (2 week minimum rental Christmas/New Years) . Easter and March weeks - $2195/wk. Each additional person is $125 per week. Please ask about our discounts for stays of two weeks, three weeks, or four weeks. 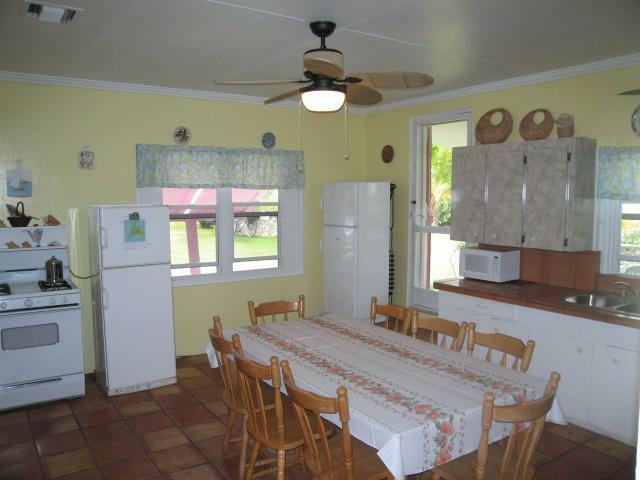 Note: This home consists of a 2 bedroom/1 bathroom main house which sleeps 4 adults and 2 small children and a 2 bedroom/1 bath guest suite which sleeps 4. Beds main house: 2 kings, 1 queen . Beds guest suite: 1 king, 1 queen. The guest suite is only opened for use when there are more than five guests or an additional fee is paid. Please ask for details. There is a $600/wk. refundable security / damage deposit required with final payment for the main house and $200/wk. for the guest suite (if in use.) Note: The rental rates are for the accommodations only. Ocean kayaks, and bicycles are offered free of charge for your use at your own risk. Note: An energy surcharge is applicable on this rental for any electric fuel charges in excess of $150/wk. so please be sure to use electricity wisely. Cleaning fee $150 for up to 4 persons, $200 for more than four persons per stay. Note: If you require a check-in at this location on a Sunday or Public holiday, or a check in after 5:00 p.m. on any day, please add $100 for this service. A vehicle is required at this location. Please call ahead to book your car rental.